Now that you have gotten the smell off of your dog, you will need to get the smell out of your house. The same solution that is described above works both for dogs and for items around your house such as carpets, couches, etc. However, the peroxide in the solution can bleach items in your house more severely than it can your dog’s coat. Here are some of the best ways to get the smell out of your house. First, open your windows, run your fans and replace any air conditioning filters. Shampoo your carpets and any towels, blankets, items of clothing or any other removable fabrics. Adding baking soda to your next wash will also help prevent the smell from seeping too deeply into fabrics. Wash yourself with the same solution you used on your dog. The smell can linger, and it’s best to wash it from your skin as quickly as possible. If you have any additional questions about caring for your dog and his coat, contact us for help. Has your dog ever been sprayed by a skunk? Has he ever brought the stinky smell into your house? If so, you probably know just how difficult it is to remove that bad smell from your pet’s coat. 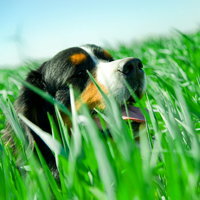 As the weather warms up, your dog is undoubtedly spending more and more time outside. Whether you live in the country or the city, skunks are everywhere, and it’s likely your dog will encounter one. Unfortunately, there is not much you can do to prevent your precious pets from being “skunked,” but there are some actions you can take after the fact to make sure your dog, and your home, goes back to smelling sweet as quickly as possible. First, keep your dog outside until you are ready to wash him. Otherwise, he might spread the smell around your house, and you do not want to have to wash everything in your house, if possible! Change into old clothes that you are comfortable getting smelly or throwing out, as it is likely that you will get dirty while cleaning your pet. Leave your stinky pup in an enclosed space outside or in a bathroom, wherever he is unable to spread the smell of skunk, and prepare the following solution. Note: Do not prepare this solution in advance because the resulting chemical reaction can cause an explosion if it’s not used quickly. Wearing rubber gloves, combine all the ingredients in a large bucket. Wash your dog with the solution as soon as possible after he has been sprayed, to try to prevent the oil from the skunk from drying on his coat. Once the skunk oil has dried on the coat, it will be that much harder to get rid of the smell. A skunk’s spray can irritate your dog’s eyes, so pay attention if they seem red or irritated. Also, avoid getting the cleaning solution in his eyes. Rub the mixture thoroughly through his fur and then rinse it off within 5 minutes. This is because the peroxide contained in the solution can irritate the skin and can slightly lighten your dog’s coat, if left on for too long. Repeatedly apply and rinse the solution until the odor is noticeably gone. Once the solution is rinsed entirely from your dog’s coat, wash your pet with his regular shampoo and rinse thoroughly. Once your dog smells sweetly again, towel him down and make sure to place him in a warm space to dry off. Although you cannot guarantee that a skunk will never spray your pet, there are a few things you can do to minimize how attractive your home is to the unwanted creatures. For instance, do not leave food or open trashcans outside. Also, placing moth balls around your property may deter skunks from getting too close. Lastly, keep an eye on your pet when he heads for wooded areas. If you do see a skunk, try to move away slowly and quietly.